During graduate school I briefly worked a part-time job as a reader for a press clipping service. This is another of those occupations that is now totally obsolete but I love to read and enjoyed the job. It’s clearly a great job for a liberal arts guy. The staff of readers would have our favorite newspapers and would try to make sure that the favorites were in our stack of papers to be read. I had personal picks among the large dailies and there were a few of the small-town weeklies that I tried to grab because of a particularly charming or quirky local columnist or point of vew. “The Boulevardier” was the title of a column written by Eugene Walter and published in Azalea City News and Review, an alternative weekly newspaper in Mobile at the time. My first reaction was Who is this guy and why haven’t I heard of him before if he’s been all of the places and done all the things he claims? The more I read, however, the more fascinated I became with the scope of knowledge and experience of a true, uncompromising, unpretentious, and erudite Renaissance man. Too late, I began to track down the biographical details of Eugene Walter (1921-1998) and realized that even if the majority of his claims were tall tales and fabrications, he still lived a more eventful and meaningful life than most everybody else. Worked with the Civilian Conservation Corps as a highway sign painter. Served as an army cryptographer in World War II. With collaborators, staged some of the first “Happenings” in the garden of New York’s Museum of Modern Art. Worked on a Paris-based multilingual international literary journal, Botteghe Oscure. He later relocated to Rome as the journal’s editor. Published a short story in the first Paris Review for which he served as a founding and contributing editor. Published his first novel, The Untidy Pilgrim, while living in Paris. It won the Lippincott Prize for best first novel. Published his first volume of poetry, Monkey Poems, during the Paris years. While in Rome, acted and worked as an assistant and translator for master Italian filmmaker Federico Fellini. He appeared in Fellini’s masterpiece 8½ and in many other films for Fellini and other directors including Blake Edwards and Lina Wertmuller. Wrote the lyrics for Nino Rota’s signature song “What Is a Youth?” for Franco Zeffirelli’s Romeo and Juliet. This theme song for the very popular film was an international hit. Wrote the best-selling classic American Cooking: Southern Style (1971) for the Time-Life Foods of the World cookbook series. Don’t get him started on ready-ground pepper (or do, it’s very entertaining): “Never use the dead dust sold as ready-ground pepper. … dead dust is only dead dust. Many restaurants which pretend to be first class, and with prices which corroborate their pretensions, do not have pepper mills … either take your own pepper mill with you, or smash an ashtray when the waiter says they don’t have one.” As random and serendipitous as Walter’s pronouncements may sound, his food-related books are meticulously researched and the scope of his knowledge and historical grasp is constantly impressive. I re-watched 8½ not long ago and particularly watched for Eugene Walter’s appearances. He’s one of those performers who glows on the screen – not so much for his acting ability as for his sheer joy in acting. He smiles broadly, his eyes are shining and shifting with mischievous glee, and he is totally present every moment he’s in a scene. I couldn’t help thinking about the similar impact Tim Blake Nelson’s performance as Delmar had for me in the Coen Brothers’ O Brother, Where Art Thou? In each case, the glee of the actor in the performance is memorable and contagious. Reading Walter’s work, one constantly has the urge to call somebody and quote a passage. But that’s a risky exercise since once you get started, you can’t stop. Almost every word on the page is quotable. Eugene Walter knew everybody. The 23-page “Cast of Characters” at the end of Milking the Moon reads like a Who’s Who of important and famous people of the 20th Century. He threw dinner parties for whomever happened to be of interest to him wherever he happened to live. He claimed to have three pubic hairs which were gifted to him by actress Tallulah Bankhead in her dressing room after her performance in The Skin of Our Teeth at a Broadway theatre during his early sojourn in New York (but then, who didn’t have such a treasure from Tallulah at that time?). Of course the stable and well-intentioned young man (who is never named) is quickly caught up in the intrigues and pleasures of his new surroundings and his Mobile friends and relatives. He is introduced to the colorful characters, artists, and underside of Mobile and encouraged to play hooky from his 8-5 grind. He samples the indiscreet pleasures around him and is taken into the fold by his more cavalier south Alabama relatives and Miss Nonie Fifield – “Fiffy” – from whom he rents a room. As with all of Walter’s writing, I found the novel compelling and terrifically entertaining. And I was pleasantly surprised when the ending of the book was a somewhat conventional one – which was not at all what I expected given what I know about Eugene Walter. The book plays around with the reader’s expectations, dips its toes in the unexpected and bizarre, and then catches the reader off-guard by concluding in a sweet and almost conventional way. That unpredictable predictability left me smiling and satisfied at the end. Eugene Walter spent much of his life in poverty, had a limited formal education, and died practically destitute, but happy. “I haven’t been smashed by the educational system, the financial system, the political system,” he said. He lived his life on his own terms and with style. When he died, a jazz funeral procession took him through the streets of Mobile for burial at Church Street Cemetery. The cemetery had been closed for a century but the city gave special permission for his interment. I wish I had known to meet him. 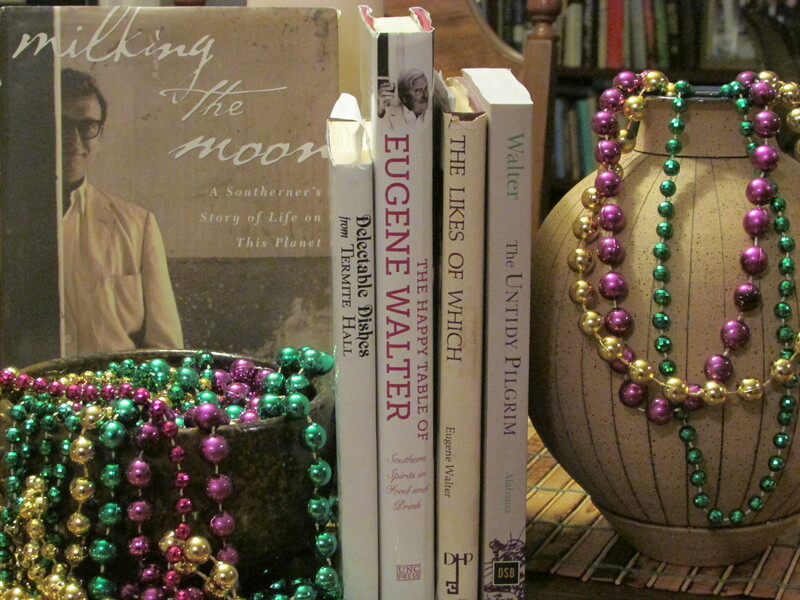 This entry was posted in Alabama, books, Eugene Walter, food and tagged Alabama, cookbooks, Eugene Walter, food, literature, Mobile, southern foodways, the south, The Untidy Pilgrim on January 24, 2015 by gedwardjourney. I wish I had some Alabama red clay in a box to keep under my bed, although never one of my homes. I have had dirt sent to me from adopted “homes.” I understand the need for the connection. Eugene is iconic. He is so often portrayed without due respect for his intelligence, and his writing genius. Thank you for this piece.